I created a document in the Affinity Photo app on my iPad Pro. I then saved a copy to my Dropbox. 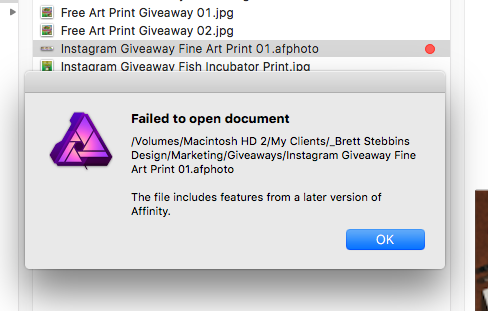 I then tried to open the document in Affinity Photo for the Desktop and I get a message that says "Failed to open document...The file includes features from a later version of Affinity." I was gearing up to use this for my next client project but now am unwilling to take the risk. Affinity Photo on iPad is version 1.6. You'll need to install the current 1.6 beta build of the desktop version to open your iPad *.afphoto files. And when will the the desktop version be out of beta and available for update via the App Store? Is there anyway to save the file from iPad to be compatible with the current version? Affinity Photo for iPad is based on 1.6 code so files created on in cannot be opened in Affinity Photo 1.5 (Desktop). You can either wait a couple weeks for the next Affinity Photo update (1.6 for desktop) or if you need to work on these files now you can download the latest Photo Beta 1.6 from here which is able to open them without issues.